Welcome to the ultimate guide for Anguilla Carnival! Anguilla Carnival is the island's biggest holiday, and is widely known and celebrated through the island (even more than Christmas it seems!). While the words "Summer Festival" stir vivid images of sequined costumes and street parades for Anguillians, many travelers to Anguilla don't know all of the "ins and outs" of Carnival. I have received several emails asking "What is Anguilla Carnival that I hear so much about?" Truth be told, I have not attended Anguilla Carnival since 2002, when I was 14 years old and only experienced one of the several days of Anguilla Carnival. A "crash course" in Anguilla Carnival has been long overdue. Not wanting to miss a Carnival beat, I went straight to the horse's mouth for Carnival information... The Chairman of the Anguilla Summer Festival Committee, Mr. James Vanier Harrigan. Mr. Harrigan, or "Vanier," was more than happy to share his Carnival knowledge, a true passion of his. So, get your highlighter ready to pick your can't-miss Carnival events! 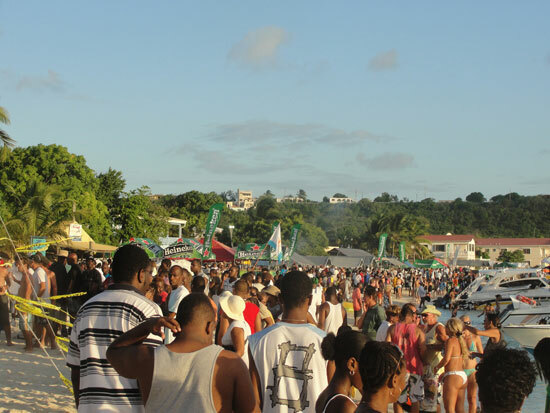 Anguilla Carnival or Anguilla Summer Festival? 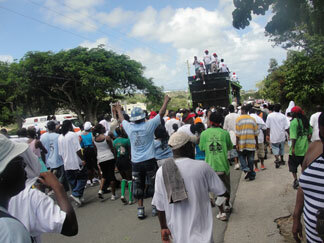 Anguilla Carnival is most often simply called "Carnival." Anguilla's "Carnival" generally refers to all of the activities and festivities that take place in the first week of August. Carnival is also called Anguilla Summer Festival. This is more of a collective name that refers to all of its events, beginning at the end of July. Also note that this is the biggest holiday in Anguilla. All government buildings and most shops (including grocery stores) close. Everything starts with the "Official Opening" kick-off evening prior to August Monday, the biggest day of the whole festival. The opening night is full of fireworks and musical performances, which takes place in The Valley. After the opening ceremonies, the Prince & Princess Show follows and the Junior Calypso Show ends the opening night. The Prince & Princess Show is a competition that displays the talents of Anguilla's youth. The competitors are made up of couples representing their respective Primary Schools. They compete in the categories of speech, talent, and evening wear. Note: The order of these events change from year to year. For an exact schedule of events for this year's Carnival, click here. Saturday is all about music. The Valley is the place to be, more specifically the Landsome Bowl (Click here for directions to Landsome Bowl). Local bands compete for a cash prize this night. It's called "Band Clash." And it's exactly that! 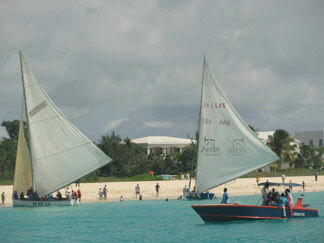 A Long-Standing Tradition - Anguilla Boatracing! The first boatrace of Carnival is on Sunday. Later on that day the Junior Calypso Show and the Prince and Princess Pageant Show take place. August Monday is always the first Monday of August. Every other event in the Anguilla Summer Festival line-up is planned around August Monday. It is the focus of Anguilla Carnival. The first August Monday celebration was in 1940, and began as a boatrace celebration. It has evolved over the years, and has become one of the biggest beach parties in all of the Caribbean Carnival celebrations. August Monday is a full day. It all begins with Jouvert Morning Street Jam at 5AM. Roughly 6,000 people do the Jouvert Morning tradition each and every August Monday! It starts moving from The Valley towards its destination, Sandy Ground. They call this "Road March." Anyone and everyone is invited to participate! It is centered around local bands who are competing for the title of "Road March Champion." Each band has its own float, usually a large, decorated truck, with a booming sound system. The singers are sometimes on top, hanging off the side, or dancing around the float! These bands, aboard their floats, lead the way down to Sandy Ground. Anyone can show up, follow the trucks into Sandy Grond, and "do the march." The revelers pick their favorite band's float and walk, or dance, in front, behind it or to the side of it. Each year leading up to Carnival, the bands release their new songs, and Anguillians start listening to the released songs for the competition to select their favorites. The loud speakers pound out the bands new songs and energize the crowd. The bands play Calypso and Soca. You can't not, at the very least, tap your foot to the rhythmic beats! August Carnival's "Road March Champion"
There are nine judges who determine the "Road March Champion." They take into consideration everything from the crowd reaction to vocal clarity. The winning band walks away with a whopping $8000, which is announced the last day of Carnival. Once the Road March reaches Sandy Ground, the fun goes on. Down on Sandy Ground and for the remainder of the day and night, there is plenty of people, music, food, beverages, and dancing to last you until next year! The Road March usually reaches Sandy Ground by 11AM. There, music shifts from floats to the stage, set up right in the sand (across from The Pumphouse) around noon. Tip: Most people driving to Sandy Ground should have their car in place well before 1PM as parking will be tricky to find due to volume. In fact, many people will team up earlier in the morning and park one car at Sandy Ground and take a separate car to get to the Valley for the start of Jouvert to do the Road March down to Sandy Ground. To get ready for the August Monday Sandy Ground scene, imagine lots of people. Now multiply that by 10. Now multiply it by 10 again! You are likely still low-balling it. It is estimated that there are 8,000-9,000 people on Sandy Ground during this time. Sandy Ground Crowds for August Monday Beach Party! There are even more people on "party boats" that are docked off Sandy Ground, and along the shoreline. On the beach, people walk, mingle, eat, dance, drink, and cool off in the water. All day long! Crowds grow more quickly once the music starts. Several bands from all over the Caribbean as well as some of Anguilla's talented musicians, hit the stage. So, what is all the partying for? The main Anguilla attraction on August Monday is the famous "August Monday Boatrace," which sets off from Sandy Ground at 1PM. It is a complete round the island boat race, and lasts most of the afternoon. This is the first qualifying boatrace. This race determines which boats can compete in the "Champion of Champions" race held on the final Sunday of Carnival week. 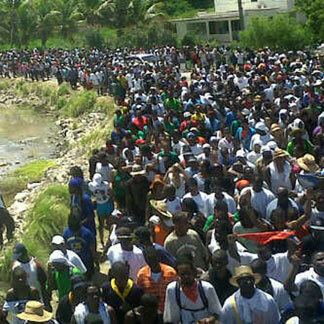 Anguillians are passionate about the August Monday boatraces. 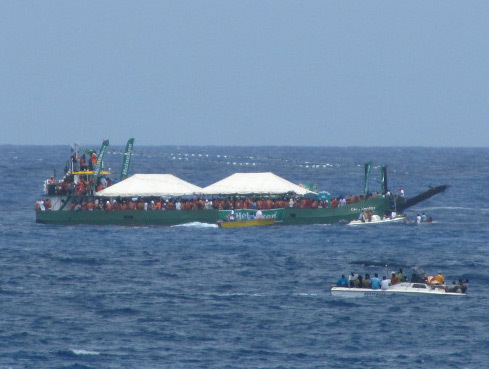 Most Anguillians have a boat that they are affiliated with. In traditional sports fervor fashion, Anguillians follow the race closely. Some even track the boats from land in their cars, binoculars in hand, shouting, groaning and cheering on their boat. You can even get tickets for "party boats" that follow the race from the sea! 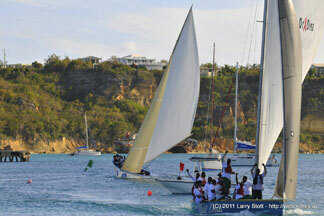 Anguilla boatracing is Anguilla's lifeblood, after all. The style of boats and type of racing is interesting, and a story for another day. Back in 2002, I remember my Dad preferred getting caught up in the boatracing excitement to the beach day party. And, my Dad has never even sailed a boat! The unbridled enthusiasm is contagious. When the race is over? The party is still going on! The beach party doesn't stop until 1AM. From Jouvert Morning at 5AM 'till the Beach Party at 1AM the next morning... How is that for a full day? Tuesday there is a boatrace and Seafood Festival in Island Harbour from 10AM until evening hours. It has been described as a mini-Festival del Mar (my favorite festival! 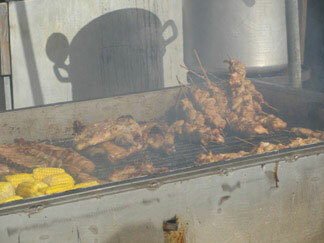 ), a seafood festival that is held in Island Harbour around Easter. There will be 3 bands playing throughout the day, and fresh seafood BBQs galore. Tuesday evening winds down with the Mr & Miss Teenage Pageant in The Valley. By Wednesday we are half way through Carnival week. Wednesday night, the Landsome Bowl starts thumping around 8PM. It's time for the Calypso Monarch competition. Calypso is rooted in the time of slavery when it was primarily a form of communication. Over the years it has become a form of creative and exuberant expression. Calypso music may cover a variety of topics from our youth to domestic violence and politics. This genre is part of Anguillian culture and Regional culture, the Calypso Monarch competition being great proof. Only twice has a female been crowned Calypso Monarch. Now, August Thursday. Meads Bay is the place to be. 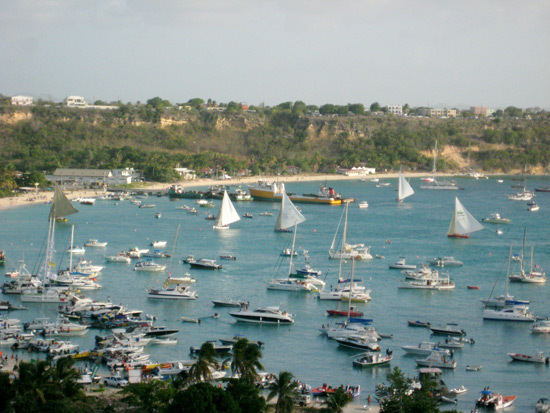 The August Thursday boatrace leaves from Meads Bay. What to do on Meads Bay while the boats are away? Food stalls are set up, grills are blazing, and ice cream trucks are scooping island flavors including Tamarind and Soursop, or good ol' Vanilla, if you prefer. If the sun is as hot as it should be in August, ice cream is a good way to beat the heat. Of course, you can take a dip in dazzling Meads Bay too. 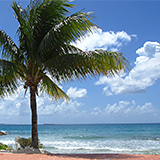 Click here to read a review of Meads Bay by Jennifer from Miami, an Anguilla-Beaches Lover! Thursday is an afternoon of more local music, local food, and of course, the National sport of boatracing. Tip: If you are seeking shade, wonder East down the beach, towards Malliouhana. If you would prefer to stay cool, and dine sea-side, book a table at Straw Hat, which is centrally located for all of the Thursday Meads Bay excitement. The Miss Anguilla Queens Pageant rounds out Thursday evening at 8PM at the Landsome Bowl. It is one of the more anticipated shows on the stage during Carnival week. The pageant includes a swimsuit and costume competition. The overall purpose is for each contestant to show strength of self in an extremely competitive environment. Friday is awaited by many. It is the second and final "Road March of Carnival!" It's called The Parade of Troupes, it begins at noon, and is a real family event. This Carnival attraction is all about vibrant, flamboyant, color displayed on the troupes as they dance and celebrate down The Valley streets (people here call it "Carnival Village" during Carnival). The streets are alive with dancing, and local music is heard for miles. Anyone is welcome to watch, or even join in the dancing. The troupes are formed from different villages on the island of Anguilla. They are also judged (by nine judges), as this is a competition. 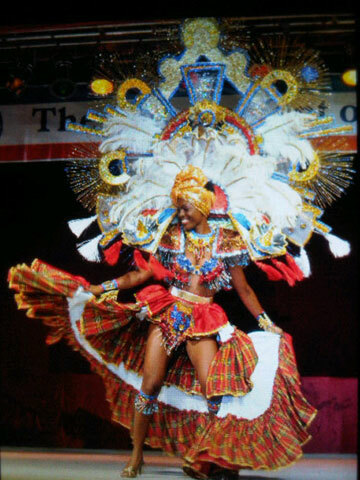 The beautiful, highly detailed costumes are judged on color, and the troupes on their performance. The prize? $3,000. It is the most colorful day of Carnival. 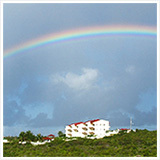 Imagine Anguilla, also known as "Rainbow City," getting even more colorful! Saturday night is the scene for the Leeward Island Calypso Competition at the Landsome Bowl. I've mentioned how ingrained Calypso is in Anguillian culture, so this final competition is not to be missed. It is also the last evening event of Carnival. The very last day of Carnival brings together the avid racing boats lovers. Sunday is the Champion of Champions boatrace. This is where the winner from each race during Carnival week compete against each other to see who really is the Champion of Champions. The winner of the "Road March" (back on August Monday) is expected to be announced on this day as well. On Sunday, Sandy Ground is sure to be packed with people one last time for the year. Yet, it is more peaceful than August Monday, and a nice end to the Anguilla Summer Festival. Anguilla returns to its quiet, serene self... Until next year's Anguilla Carnival! Experience Carnival! See you there!